Looking for a nice gift idea? Look at this Firefighter Chess Set. If your friend or family member is working for the Fire Brigade or the Police, then this might be a nice gift idea. Show your appreciation for the servicemen of your town with this nicely crafted and painted set. The kings are 3 inch high and a nice complimentary wood chessboard is available. 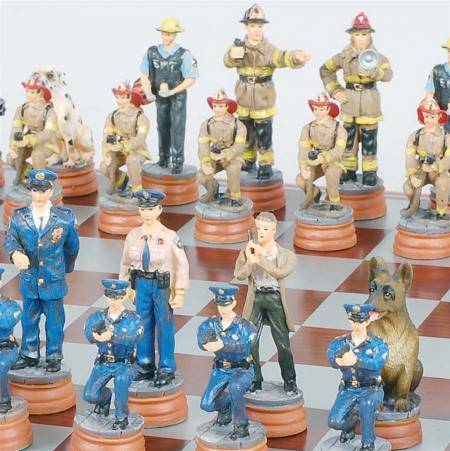 This hand painted cast resin Police vs Firemen chess set is exquisitely detailed by old world sculptors and artists. This theme chess set features pieces with felted bases and the chess board is all wood. Get Firefighter Set - Click here! This colorful Firefighter chess set helps us remember this dangerous job that saves many lives. It is created of solid poly-resin, is durable and each piece is hand-painted with long-lasting, lead-free paint. The webstore pre-inspects each piece. This set is hand-inspected piece by piece and extra care is taken to optimize packaging and shipping. This nearly guarantees a delightful delivery. Choose a chessboard, if you like. 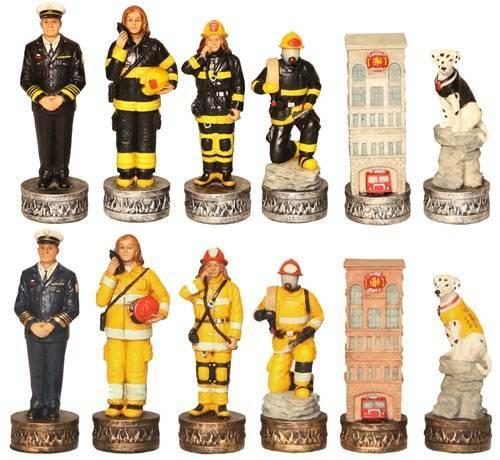 Get Firefighter Chess Set - Click here! This Online Shop below has great theme chess sets of different kinds. Get Great USA Theme Chess Sets - Click here!